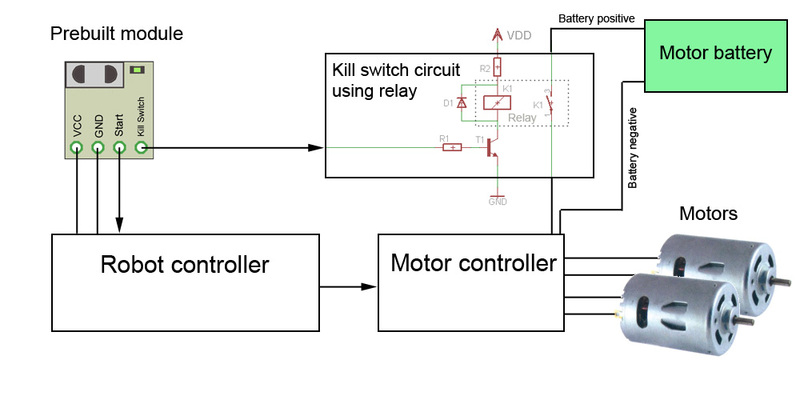 In the illustration above it is described how the prebuilt module should be connected and how the kill switch circuit can be implemented using a relay. The idea of the circuit is that the relay will cut the power to the motors as soon as the kill switch signal goes low. The components in the circuit are the following. K1: This is the relay which cuts the power to the motors. VDD: This is the voltage source that is used to power the relay. T1: this is a standard NPN transitor. D1: This is a protection diode which protects the transistor from currents produced when the relay is turned of. R2: This is a serial resistor which limits the current running through the coil of the relay and the transistor. R1(Optional): is a serial resistor which limits the current through the transistor this one is optional since there is already a 1K ohm resistor on the prebuilt module.